Business Partner Contact users can be configured for use with Customer Portal, Vendor Portal or applications built using Interconnect. Business Partner Contact user set-up is done through SAP Business One. Before configuration can begin, InterConnect Manager Add-On for SAP Business One must be enabled. 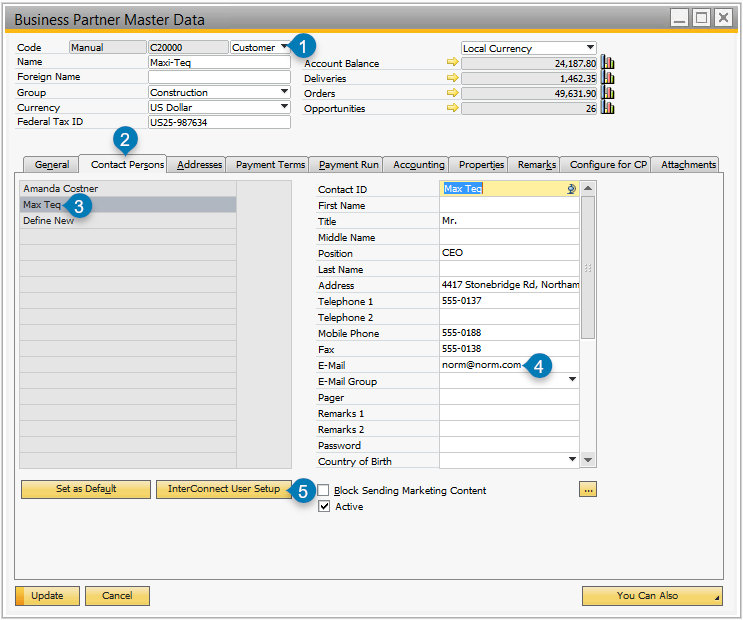 Open the Business Partner Master Data record in SAP Business One. Go to: Business Partners > Business Partner Master Data. 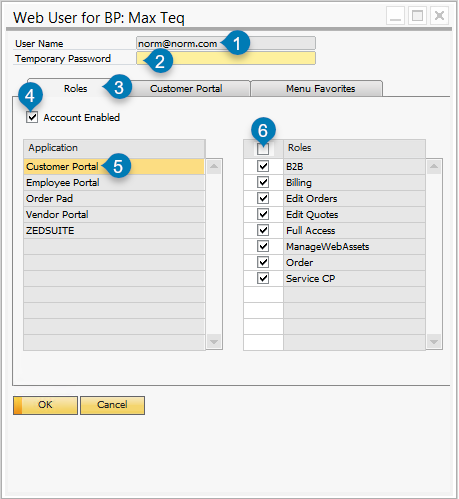 Ensure the Business Partner type (see marker 1 below) matches the Portal being configured. Customer type is required to access Customer Portal, while Vendor type is required to access Vendor Portal. Open a Business Partner’s data and navigate to the contacts tab of the Business Partner (see marker 2 below). Select the desired Business Partner Contact (see marker 3 below). On the contacts tab, ensure that there is an email address assigned to the contact that will be enabled for web login (see marker 4 below). Without an email address, the user will not be able to log in. This email address must be unique. Use the “InterConnect User Setup” button to open InterConnect Manager Add-On user configuration screen (see marker 5 below). Set the Business Partner type (1). On the Business Partner Contacts tab (2), select the contact who will be enabled for web login (3). Ensure that the user has an email address (4), then use the InterConnect User Setup button (5) to update web user settings. Fill in user data as described in the User Configuration section below. Once the Portal User has been opened, fill in all Roles details as described below. Role information is required for all users. Open the Roles tab to complete these fields (see marker 3 in the screenshots below). Once users are configured, they can log into a configured Portal or custom websites developed using Interconnect. Business Partner user Roles section. User Name is based on the email address, and cannot be modified manually. See marker 1 in the screenshots above. Temporary Password can be optionally assigned. It will prompt the user to change their password, at which time the temporary password will be deleted. See marker 2 in the screenshots above. Account Enabled flag must be checked in order for a web user to be able to log in. See marker 4 in the screenshots above. Roles in the right-hand menu (marker 6 in the screenshots above) can be set for each Application selected from the left-hand menu (marker 5 in the screenshots above). Apply changes using the Update button. Note that the table below only defines system roles. Additional roles may be installed with sample metadata, or if custom configuration has been applied. All installations of Customer Portal include the following roles. Custom roles may optionally be added. B2B B2B Marketplace Grants access to B2B Marketplace collections, search, and cart functionality. Requires a B2B Marketplace License. Billing Standard Grants access to the ability to pay invoices, if payments are configured. B2B Marketplace Allows the user to edit existing orders that have not yet been closed. Requires the Order role. B2B Marketplace Allows the user to edit existing quotes that have not yet been closed. Requires the Order role. B2B Marketplace Grants access to all core Customer Portal features and reports. May not grant access to custom menu entries. Order Order Pad Grants access to Order Pad, if this is licensed. Service CP Standard Grants access to Service Call module of Customer Portal. ManageWebAssets Sales User Grants access to managing web assets such as CSS and media files (images). Requires a Sales User license. May be applied to employee or customer users. Vendor users may be configured to access reports. Additional roles may optionally be added. Vendor Grants access to Vendor-specific reporting. Business Partner user Customer Portal tab. Note: Branches are an optional feature for SAP Business One. This setting only applies to companies that have Branches enabled in core SAP Business One settings. 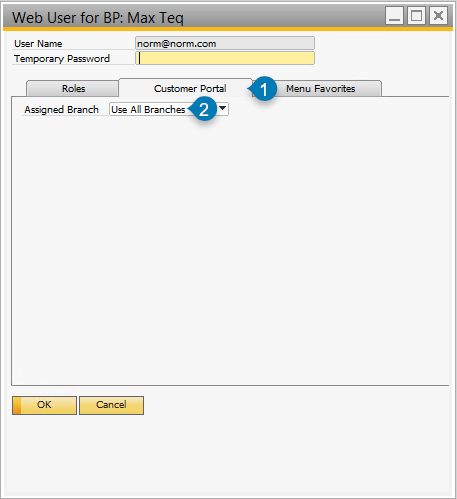 If the user does not have an assigned branch, then the user can choose the desired branch based on the branches assigned to that user’s Business Partner. When performing transactions, such as placing an order or paying an invoice, the user must select the desired branch before performing the transaction (for example, the user must select a branch before they can pay invoices, and another branch must be chosen before they can pay against a second branch). If the user is assigned a branch, then the user will perform all transactions using the assigned branch. The user will only be able to see query results that include the user’s assigned branch (for example, the user will only be able to see orders that were placed at the specified branch). In addition to per-user configuration, B2B Marketplace requires Business Partner configuration. Note that prior to configuring a Business Partner’s settings, configuration for B2B must be applied, for example, you must set up one or more Store Fronts, and one or more Shipping Groups. See B2B Marketplace Configuration Guide for a walkthrough of necessary configuration. 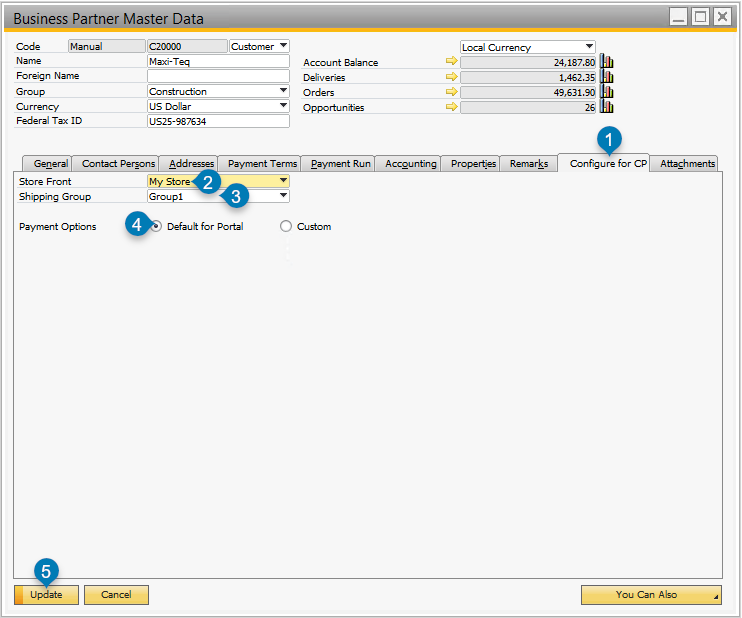 Edit the Business Partner in SAP Business One. Open the Configure for CP tab. See marker 1 in the image below. Open the Configure for CP tab (1); Assign the customer's store front (2), Shipping Group (3) and Payment Options (4); Update the BP to apply changes (5). Apply preferred settings for this customer. See markers 2, 3, 4 in the image above. Note that default settings for Store Front and Shipping Group must be created prior to assigning them to a customer. If these settings do not exist, B2B functionality will not work. Update the Business Partner to apply changes. See marker 5 above.